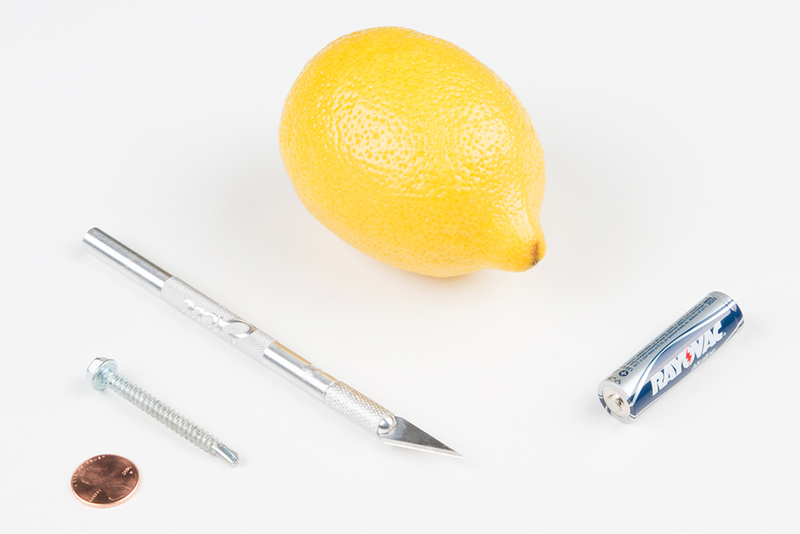 In this tutorial, we will make a crude battery out of a lemon, a zinc-plated screw, and a copper-plated coin. The metals in the screw and the coin react with the acid in the lemon to create a flow of electrons. Lemons, in reality, make for poor batteries. One reason is that the zinc continues to react with the lemon without a circuit present. This means that the battery would only have a shelf life of a few hours. 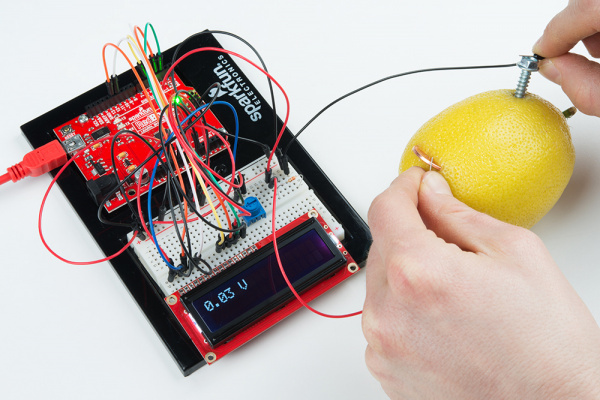 Another factor is the internal resistance of the lemon battery. We will discuss internal resistance in the next section and why it is important for batteries. In addition to these materials, you will need a way to measure voltage. 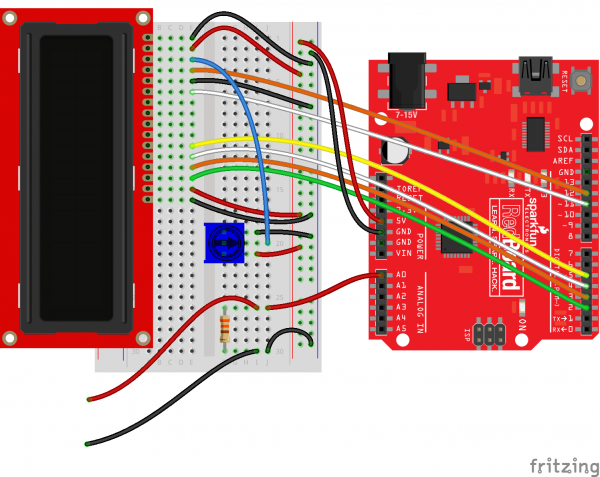 A multimeter will offer the best accuracy, but you can also build your own voltmeter from parts found in the SparkFun Inventor's Kit. 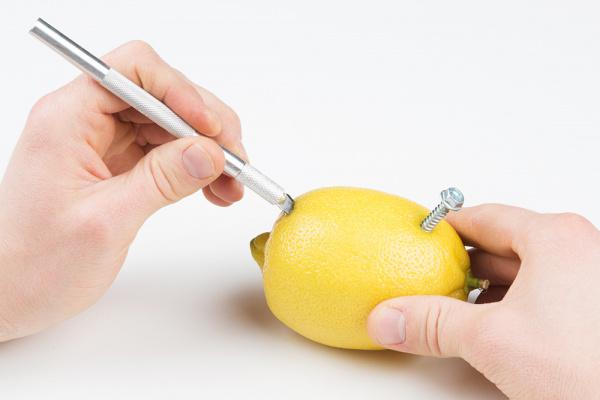 In addition, you will need a hobby knife to cut a slit into the lemon. 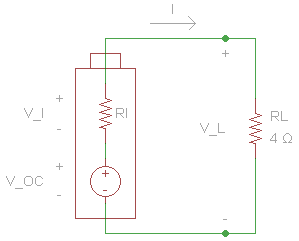 When designing a circuit with a battery, we often assume that the battery is an ideal voltage source. This means that no matter how much or little load we attach to the battery, the voltage at the source's terminals will always stay the same. In reality, several factors can limit a battery's ability to act as an ideal voltage source. Battery size, chemical properties, age, and temperature all affect the amount of current a battery is able to source. 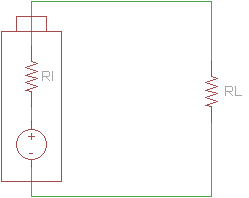 As a result, we can create a better model of a battery with an ideal voltage source and a resistor in series. 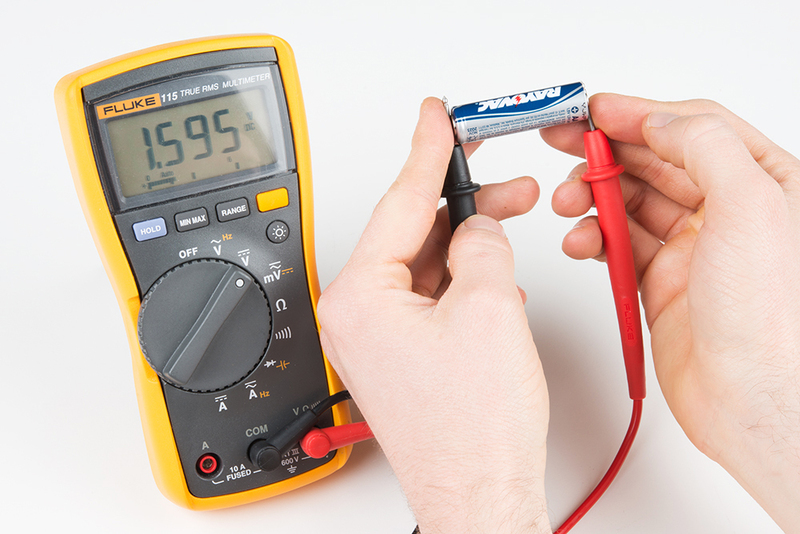 We can measure the voltage of a battery across its terminals without any load connected. This is known as the open-circuit voltage (VOC). 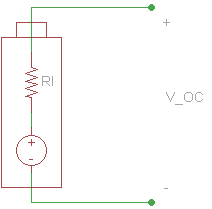 Note that because no current is flowing across the internal resistor, the voltage drop across it is 0 V. Therefore, we can assume that VOC is equal to the voltage of the ideal voltage source in the battery. If we connect a load across the battery, the voltage across the terminals drops. This drop in voltage is caused by the internal resistance of the battery. We can calculate the internal resistance if we take readings of the open-circuit voltage and the voltage across the battery's terminals with a load attached. To start, we create a diagram showing our circuit. Here is our circuit. We want to calculate RI. We can plug in the loaded voltage we measured (VL) and the value of the resistor (RL) into Ohm's Law to get the current flowing through the circuit (I). We also need to get the voltage across the internal resistor. We can do that using Kirchhoff's Voltage Law. Simplified for this circuit, we can say that the voltage drop across both resistors must add up to the voltage of the ideal voltage source. Now that we know the voltage drop across the internal resistor and the current through it, we can use Ohm's Law again to find its resistance. From this, we can see that the internal resistance (at this moment) of the AA cell is 0.273 Ω. NOTE: We can only take a snapshot of the internal resistance with this method. The internal resistance can vary with things like battery age and temperature. In 10 minutes, the resistance value might be different! A common AA alkaline battery might have anywhere between 0.1 Ω and 0.9 Ω internal resistance. NOTE: This part is optional if you already have access to a voltmeter or multimeter. That being said, it can be fun to build a voltmeter to understand how to use an analog-to-digital converter. Once you are done, you should have 2 wires hanging out from the side of your breadboard. These will be your probes for testing voltage across terminals. Note that we have a 330 Ω resistor across the probes. This will act as our load for the first test. *  the resistor to measure the open circuit voltage. *  NOTE: The voltmeter is only capable of sensing 0 - 5V. 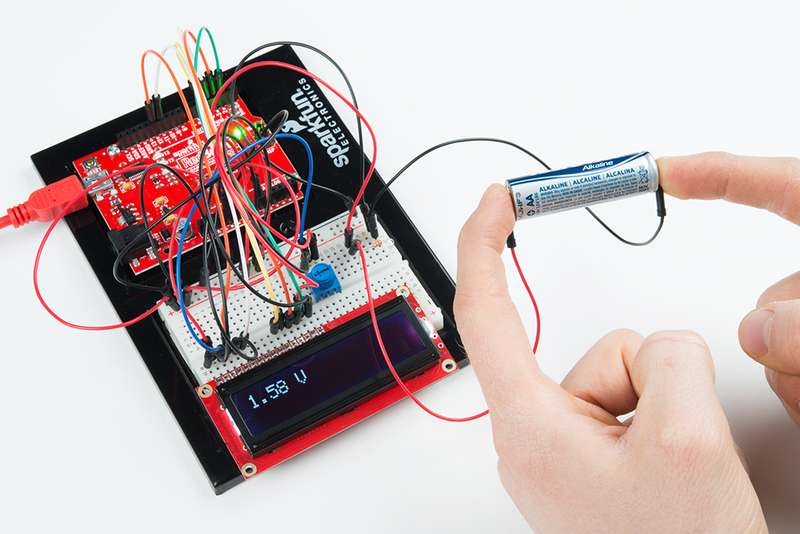 Once you have uploaded the code to the RedBoard, try touching the ends of the probes across the terminals of the AA battery. You should see a voltage reading appear on the LCD. IMPORTANT: The voltmeter we just made cannot sense negative voltages! Make sure you touch the A0 probe (red wire) to the positive (+) terminal of the battery and the GND probe (black wire) to the negative (-) terminal of the battery. NOTE: If you cannot see text on the LCD, try turning the potentiometer's knob to adjust the LCD's contrast. We get to build a battery! This is a crude fruit-based battery that will not last very long nor drive much current. However, it is useful for measuring internal resistance. IMPORTANT: Please don't eat the fruit after you have made the battery! Zinc ions that are floating in the lemon juice certainly can't be healthy for you. 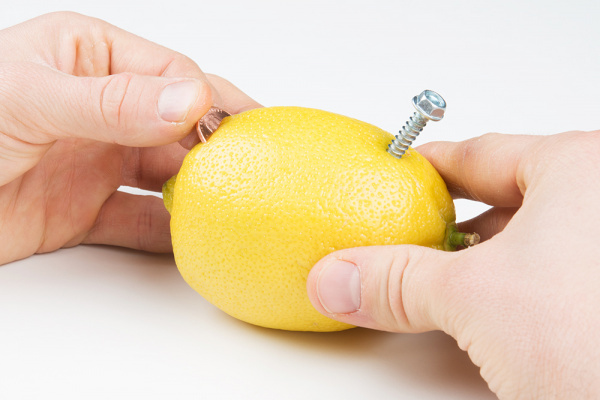 Insert the zinc screw or nail into one side of the lemon. Use the hobby knife to cut a slit in the other end of the lemon. Insert a penny into the slit so that half of the penny is still outside the lemon's skin. And that's it! We successfully created a battery. Make sure that the penny and screw cannot touch each other, or you will create a short circuit between the electrodes. While the short circuit will not start any fires, it will not produce a voltage for our experiments. NOTE: If you would like the battery to last longer than a few hours, remove the screw. 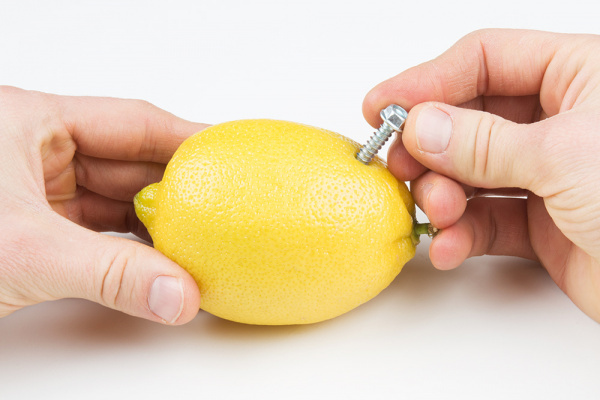 Even without a circuit connected, the screw will continue to oxidize in the presence of the lemon juice. Touch the negative probe (black wire in the picture) to the anode (nail/screw) on the battery, and touch the positive probe (red wire in the picture) to the cathode (penny) terminal on the battery. Record the voltage under "330 Ω Load." NOTE: If you are using a multimeter for this exercise, we recommend using something like alligator test leads to hold the resistor across the electrodes of the battery. Replace the 330 Ω resistor with a 10k Ω. Repeat the process to measure the voltage across the battery. Record the voltage under "10k Ω Load." Remove the resistor from the breadboard and take another measurement. Record the voltage under "Open Circuit." Using the voltage readings from the "10k Ω Load" and the "No Load" (open circuit), calculate the internal resistance of the lemon battery. Hint: Refer to the Internal Resistance section to see how to calculate this value. 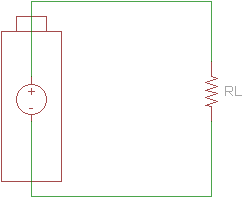 Does the internal resistance of the lemon battery seem high or low? Re-calculate the internal resistance using the "330 Ω Load" and "No Load" values. Does it match your first calculation? If not, what do you think would cause the difference? Perform the whole experiment again using a consumer-grade battery, such as a AA alkaline cell. What is the maximum current a AA can provide? Try making batteries out of different fruits and vegetables. Which have the best voltage and current sourcing capabilities? Connect several fruit-powered batteries to light up an LED. How many do you need? 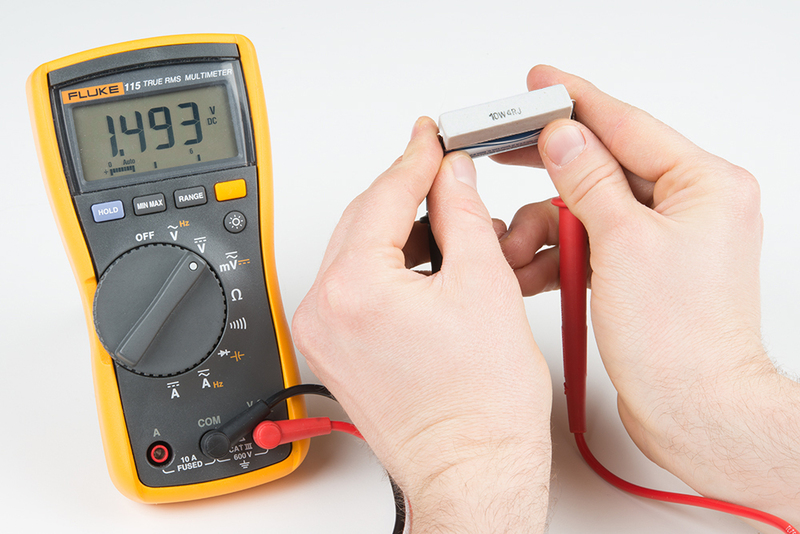 Measure and calculate the internal resistance of different consumer batteries.